Find artworks, auction results, sale prices and pictures of John Wilmot Rochester at auctions worldwide. ROCHESTER, John Wilmot, Earl of (1647-1680). Sodom. Translated by Theophil Marquardt. Leipzig: privately printed for subscribers, 1909. Folio (395 x 295 mm). 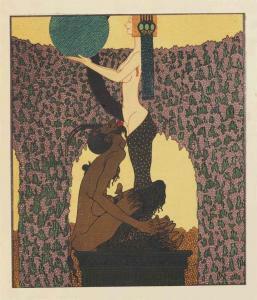 Title illustration and 15 plates by Julius Klinger (1876-1942), two of these printed in colour and mounted as issued. (Light marginal soiling, some light scattered spots, split between some gatherings.) Original rust-brown moiré silk covered boards, the upper cover ruled and titled in gilt, black endpapers (hinges split but holding, extremities rubbed). , with Julius Klinger's highly distinctive Vienna Secession illustrations, these grounded in Art Nouveau yet unlike anything of the time. Marquardt prepared his translation form a manuscript in the Hamburg City Library. A facsimile edition appeared ca. 1975 with which this rare first edition is sometimes confused. Number 316 of 350 copies.